Photo: E.Landor, Ealing, The Book of The Cat (1903) by Frances Simpson. Image courtesy of The Harrison Weir Collection. 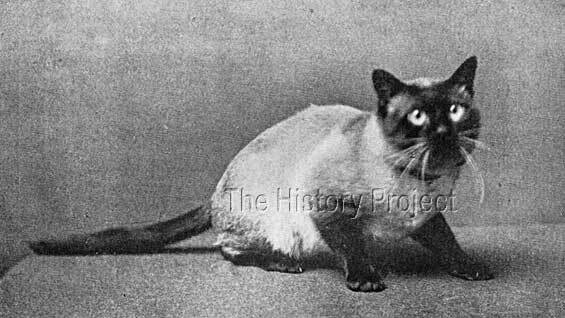 In her day, 'Ah Choo' was the 'glamour girl' of the Siamese breed. Her dam 'Polyphema' was a powerhouse of Mrs. Vyvyan's famous strain of 'Tiam O'Shian' Siamese and 'Ah Choo' was the product of a father to daughter breeding between 'Tiam O-Shian III' and 'Polyphema'. Being a daughter of 'Polyphema', 'Ah Choo' can also claim full sibling status with a string of top class Siamese, and as a daughter of 'Tiam O'Shian III', to being a sire-sibling to a plethora of other cats, bred from this particular bloodline. The risks associated with showing were not to be underestimated. 'Show fever', as distemper was invariably called, was a very real threat, and many an excellent specimen was shown, only to return home to die. When one considers the tragedy of these losses, it is easy to see how the breed gained a reputation for being "delicate", and "more sensitive" than even the most delicate of longhaired breeds. Yet despite these disappointments, the dedication of these early breeders won through, and it is thanks to their sheer determination and hard work, that we can count 'the Royal Cat of Siam' among the most popular breeds on the planet today. 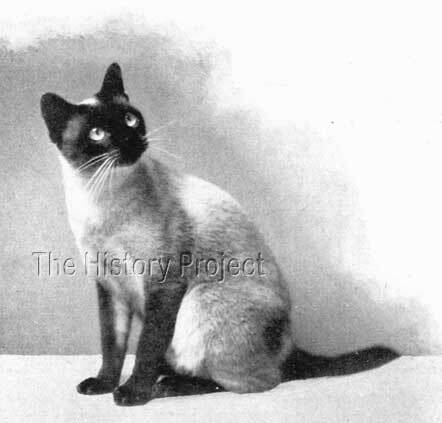 'Ah Choo' was chosen as a model for the medal of the Siamese Cat Club. 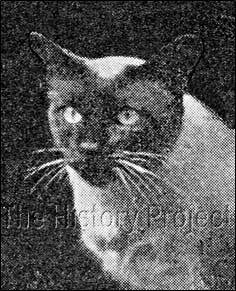 'Ah Choo' was born on 3rd May 1900, bred by Mrs. Vyvyan. She was sired by 'Tiam O'Shian III' and out of his most famous daughter, 'Polyphema', who was at that time, regarded as one of the best Siamese females to have graced the show bench, with perhaps the exception of her other daughter 'Champion Eve', who was a full older sibling to 'Ah Choo', born in 1899. So we can fully understand how pleasing it must have been for Mrs. Vyvyan to be able to claim to own and have bred three females of such outstanding quality, and all of them sired by her own home-bred 'Tiam O'Shian III'. None-the-less, Mrs. Vyvyan could not justify keeping another daughter and 'Ah Choo' found her way into the hands of Mrs. Robinson, the owner of 'Ch. Wankee' and no doubt great things were expected from her in such experienced hands, and with 'Ch. Wankee' as a potential mate. 'THE BOGIE MAN', who was desexed , and became the pet of Rev. P.L. Cosway. 'Tiam O'Shian', of course, was widely used, but sad to say, despite this, few if any, of his own lines have survived to this day, but the combination that produced him, lives on in the progeny from his older sibling, 'Eve', who as the dam of 'Bandoola', is the forebear behind 'Prince Vudighi' and thence to 'Litabois', who may consequently be found behind most Siamese of today. 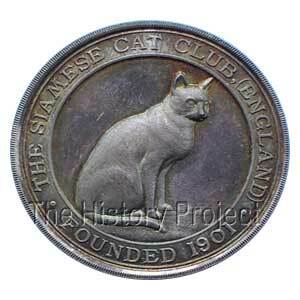 So now we know that this wee lady impressed enough fanciers and members of the newly formed Siamese Cat Club, to be selected as the most suitable model for the Club's first medallion, which is shown below. 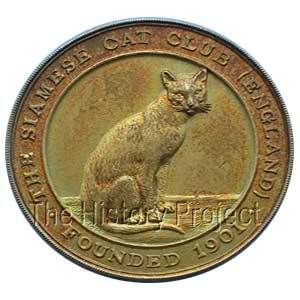 Two Medals of The Siamese Cat Club. Above left, the earlier design, based upon the image of 'Ah Choo'. (this one dating from c.1924). Above right, a later version, with an amended style Siamese, (this medal awarded in 1960, to the well-known Siamese male 'Silken Sultan'). There are no records of any surviving progeny from 'Ah Choo'. In Summary - No doubt, the fact that we can find no progeny from 'Ah Choo' and 'Ch. Wankee' must have been huge disappointment for Mrs. Robinson, who was later to lose her beloved 'Ch. Wankee' in 1903. We can only speculate on what such progeny would have looked like, coming from the only Champion Siamese male in the country, crossed with the glamour girl from most consistently fine line of Siamese females produced to date! But we must also be thankful to see 'Ah Choo' and to 'Eve' and to know that this same combination was successfully completed when 'Eve' was bred to 'Ch. Wankee' and produced both 'Boodum' and 'Banjoola', and that 'Banjoola' went on to deliver 'Ch. Prince Vudighi', who in time became one of the pillars of the breed.